Editor’s note: Science, technology, robotics, engineering, art and math: In our schools and communities, there is more demand than ever for STREAM. Yet only about a third of eighth-graders score “proficient” in math and science. In this ongoing series, we’ll explore how schools and organizations are approaching STREAM in new, game-changing ways. Read more installments here. How do you solve the problems that arise with longer journeys into outer space with reduced payloads? How does an astronaut work in microgravity? Ask Thomas Salverson and Emily Takara, the October 2016 winners of the Future Engineers’ Think Outside the Box Challenge. Salverson used 3D printing technology to make expanding pod storage containers that help reduce storage issues in space while Takara created a “space anchor” that helps astronauts keep from getting stuck while floating in microgravity. The Mars Medical Challenge is the fifth in a series of space innovation challenges in the Future Engineers’ Think Outside the Box Challenge. The challenge: K-12 students must create a digital 3D model of a medical or dental object that an astronaut could use on a three-year mission to Mars. Submissions accepted through Jan. 25, 2017. Additional details here. Impressed? You should be. Salverson is a freshman in college. And Takara? She’s in middle school. Both are budding engineers who are changing how we think about engineering. The Future Engineers’ Think Outside the Box Challenge is the fourth in a series of engineering challenges posed by a trio of organizations: NASA, the American Society of Mechanical Engineers (ASME) and online education platform Future Engineers (FE). Since 2015, the FE challenge has asked students ages 19 and younger for their ideas in solving big questions using 3-D printing technology. The latest theme: the Mars Medical Challenge (details to the right). The competition was co-founded by mechanical engineer Deanne Bell (you may know her from CNBC’s reality television series Make Me a Millionaire Inventor). For Bell, the value of the FE challenge is that students get the chance to create usable objects. All these students need, she says, is a good challenge — which is something engineering presents in abundance, she says. Organizations like FE push the boundaries of engineering — the “E” in much-discussed STEM (science, technology, engineering and math) education — but is it enough to quench the nation’s thirst for STEM-focused jobs? Already, nearly half of surveyed businesses report a skills gap when it comes to STEM, which means they don’t have the employee skills needed to effectively compete in the near future. Unfortunately, closing that gap is far from easy. While Salverson and Takara provide inspiring examples of students embracing STEM in the form of engineering, many more struggle to simply grasp what an engineer is. In a 2005 American Society for Engineering Education report, more than half of surveyed students said they think that engineers’ tasks include repairing cars, installing wiring, driving machines and constructing buildings — a far cry from the modern profession of engineering. This has got to change, says Noha El-Ghobashy, ASME executive director and president of Engineering for Change. Students need to understand the power of engineering and that it’s not only for students who excel in math and science, she says. It’s not just students who need to understand this, says El-Ghobashy. The same is true for teachers whose interaction with engineering may be limited in traditional education programs. “They don’t quite understand what [engineering] really means, so I talk about critical thinking skills, problem solving, creativity and innovation,” says El-Ghobashy. That, she says, resonates with both teachers and students, and slowly but surely is changing the perception of what engineering is and why it might be a viable career path. Also helping to change misconceptions about engineering is the National Academy of Engineering’s LinkEngineering program. 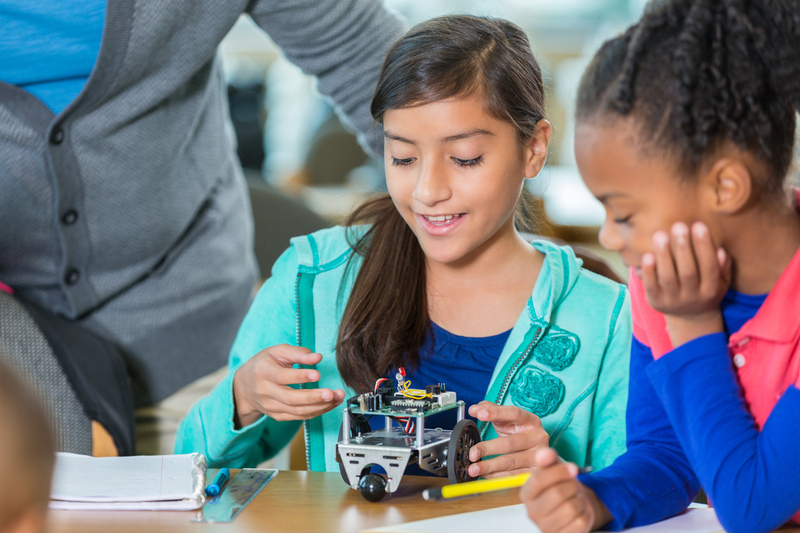 Launched in 2015, the three-year project provides K–12 students with engineering resources and connects educators with other educators who teach engineering. One of the goals is to better define engineering so that teachers can more clearly educate their students about the profession. “It’s an opportunity to join a community of people who are “all trying to figure out the next step in the evolution of STEM education,” says LinkEngineering chair Cary Sneider of Portland State University (PSU). This change, however, is a work in progress. 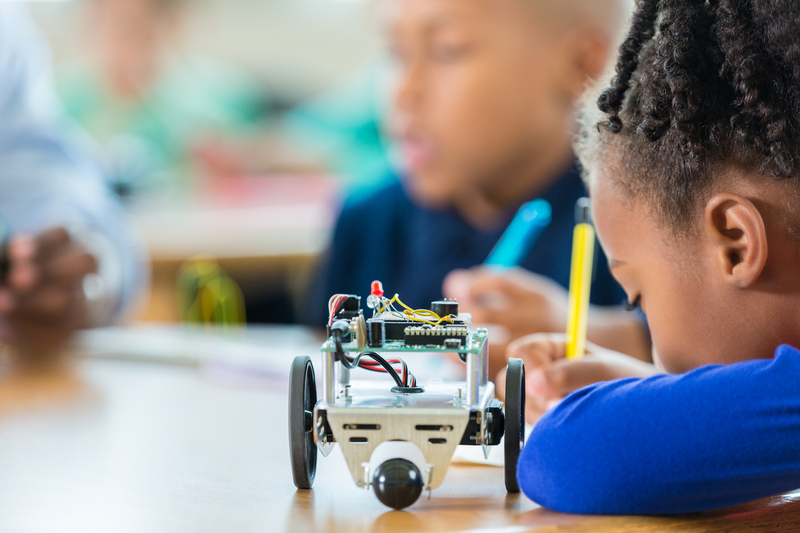 In the past 15 years, engineering education has grown in grades K–12, with several million primary and secondary students benefiting from formal engineering education. However, the number of K–12 educators who can teach engineering remains small in comparison to the demand for engineering teachers. There is another way that K–12 education embraces engineering: STEAM. This learning approach takes STEM and adds an “A” for an arts component. In the case of engineering, this typically means a focus on design. Engineering involves a systematic approach to solving problems, says Sneider of PSU, and that means identifying what problem needs solving, the criteria and constraints for successful solutions and lots of creative brainstorming. As such: “It is important to think outside the box, think of really creative solutions or ways to use old solutions to solve new problems.” STEAM, he says, fits right into that. An assistant professor of mechanical engineering at the University of Delaware, Jenni Buckley sees more and more students coming to college with an interest in combining art and engineering — a change she’s happy about. “I think exposing young people to art and engineering side by side, as is the case with many new STEAM initiatives, is a fantastic idea,” she says. “The two are intrinsically linked in the real world.” In response, her university has expanded its curricular offerings in product design and engineering design. Also inherent to STEAM’s mission is the call for producing creative students who innovate, says Ruth Catchen, a STEM/STEAM educational consultant from Denver, Colorado. “The more creative and industrious a student is to solve a problem, the further that he or she may advance,” says Catchen. Often, she says, including the arts can help open doors for students who might not have ventured into STEM in the first place. In many schools, STEAM appears in project-based learning whereby students are given a project, expected to creatively solve problems with each other and then engineer a solution. Two examples of STEAM project-based learning in our state are Wenatchee Public Schools and Seattle Girls’ School. Every year third-graders in Wenatchee Public Schools in Wenatchee, Washington, learn about the salmon life cycle. Recently — thanks to an expanded STEAM program students had a new experience added to the curriculum: They started growing their own salmon. Using fish tanks in their classrooms, the students hatched and raised nearly 100 summer Chinook salmon before releasing them into a local river with the aid of the Cascade Columbia Fisheries Enhancement Group. Where does engineering fit into all of this? At one point during the project, students noticed salmon eggs were getting caught in the netting of the tank’s egg basket. Concerned, they designed a prototype of a new basket using popsicle sticks and netting. Then, using a 3D printer, they created the solution. They sent that final result, along with a letter explaining the problem, to the tank manufacturer. Wenatchee isn’t the only school changing how it teaches STEAM. Among the many student projects taught at the Seattle Girls School, sixth-graders have designed and engineered go-carts while eighth-graders have studied aeronautical engineering by building a real twin-engine plane. All of these efforts relate to exactly what El-Ghobasy believes engineers should be doing: creating solutions that help people thrive. And, Yakman says, it’s working. In her work across the U.S. as a STEAM education consultant, Yakman, like El-Ghobasy, sees more and more people embracing this change in education.